The Star Trac Pro S treadmill is an advanced commercial model designed for the serious home user as well for use in health clubs and recreation centers. Star Trac is a top manufacturer of treadmills along with Life Fitness and Matrix and they’ve been designing quality equipment since the 1970s. 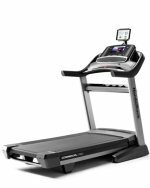 The Star Trac Pro S treadmill features the Soft Trac® triple cell cushioning system for maximum shock absorption, Aero bar provides curved arm supports, superior display readout, customized message window, personal fans, and stop keys. Want more goodies? How about a water bottle compartment! Stop button on the side rail! A personal stereo holder! Magazine rack! It seems as if they thought of everything when they designed this baby to include in the quality line of Star Trac treadmills. 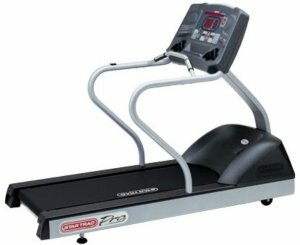 UPDATE: The Star Trac Pro S treadmill is no longer available. Check out the most popular models on sale here. Experts can’t find fault with the Star Trac Pro S treadmill which can come equipped with either a 3.0 HP or a 5.0 HP motor beating at its core. The superior advantage of this Star Trac treadmill over others in its price range is the electronics. Owners of the Star Trac Pro S love the large display readout: your progress is charted on the oval running track as well as the bars indicating elevation and the LEDs displaying time, distance, calories burned, resistance, heart rate chart and so on. And you’ll love the Star Trac Pro S’s pre-programmed workouts that cover uphill climbing (alpine, forest and trail), training (5K, 10K, custom, fit test runs), and weight management (custom interval, manual, heart rate). There are simply no cons to the Star Trac Pro S. We’ve seen them lined up next to Nautilus, Precor, and Cybex treadmills at the health club — and the Star Trac is usually the first one taken. It might be too pricy for casual users with an MSRP of $6995, but we’ve seen it for less than $4700. Bottom line: the Star Trac Pro S treadmill is a great machine at whatever price you pay.